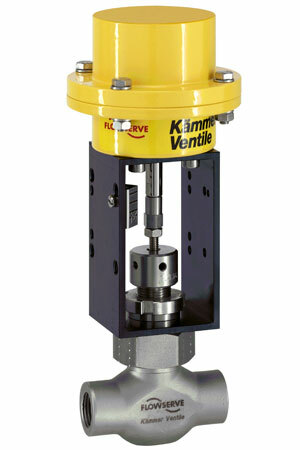 For Flowserve, a Low Flow valve is a valve with a range of Cv value between 0.01 to 4.7. Flowserve also manufactures Micro Flow valves designed to offer lower Cv than 0.01 and down to 0.0000012. In the Flowserve control valve portfolio a wide range of valves are designed to offer both ranges. These products are widely used for applications in laboratories and industrial research departments as well as industrial processes requiring high degrees of control accuracy. Flowserve Kammer Series 080000 low flow laboratory valves are designed for precision controlling. The body is manufactured from bar stock stainless steel and is easily adapted to meet application requirements. Together with the series 1 actuator it forms an extremely compact control valve. Extremely low Cv values down to 0.000063 with reproducible trim characteristicsManufacturing of micro Cv trims is one of our core competencies. to CL 600 / PN 160 with a max. Cv of 4.7. Series 020000 are split body style valves manufactured from forged material. This engineering design easily adapts to meet application requirements. Furthermore this design makes the valves easy to clean and maintain. The seat is clamp in between the upper and lower body, which allows to change thr trim without any special tools. With APV flanges PN10 the series 030000 becomes a light duty 1/2″ valve for the food and beverage industry for carbonizing applications. barstock material can easily adapted to meet application requirements. Together with the series 1 actuator it forms a compact control valve (285000).